The rolling hills above Tijuana’s sprawling suburbs define the physical landscape of a city not often thought of for its geology. 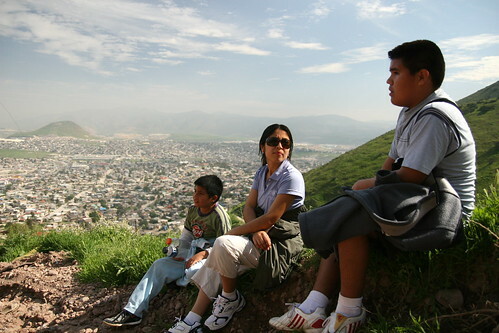 The highest peak, Cerro Colorado (Red Hill), stands about 500 meters (1,640 ft) above sea level. 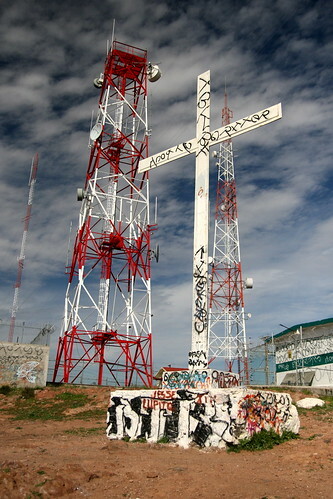 The western edge of the summit is marked in white with the phrase “Jesucristo es el Señor” (Jesus Christ is Lord). 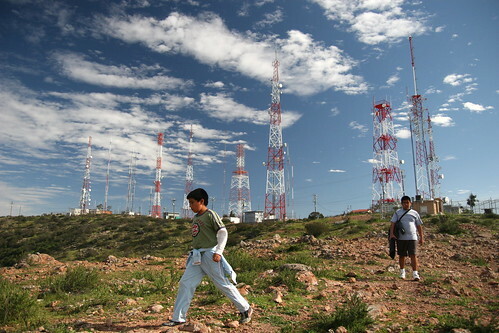 Local radio and television stations broadcast from antennas on top of hill. 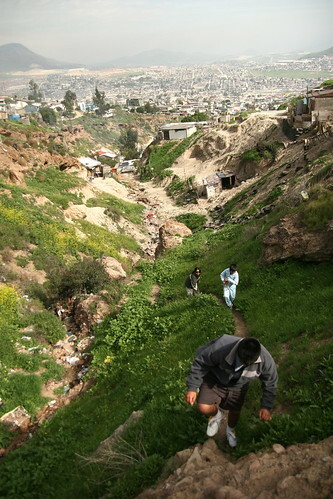 A dirt trail carved out by maintenance trucks runs up from the eastern edge of its base in the neighborhood El Florido. People use the trail to hike to the top. 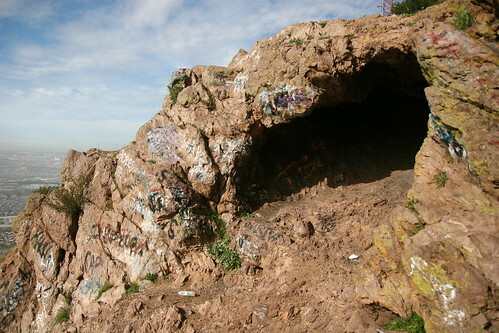 In addition to the panoramic view, there are a couple small caves along the sides of the peak. Thats a cool look out from up there. Be carefull you could be considered a coyote. Also you might be giving up some views for the migra. 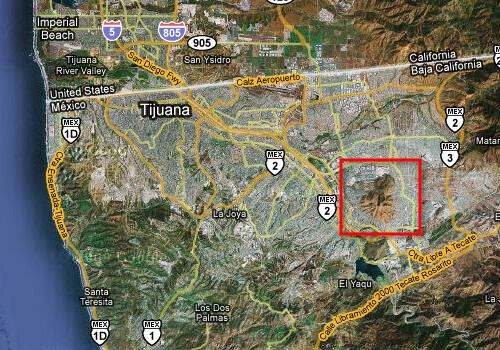 It’s amazing how well defined Cerro Colorado is on the satellite imagery. Great photos, as always. 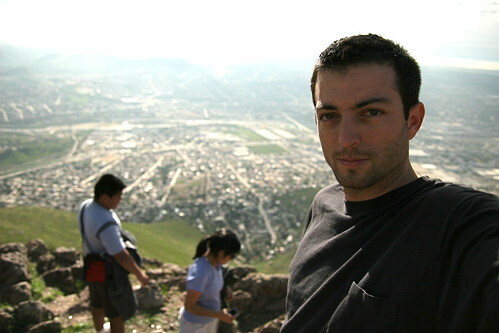 Your pictures are beautiful, and inspire me to get out and explore Tijuana more. I’m in Tijuana for a few weeks as an English tutor, among the Chinese population in Parque de la Amistad,and came upon your blog in a search for a more authentic kind of “sight” – seeing. Could I ask if you have any sites or activities in particular that you would recommend? I’d love to get a better look at the public arts scene here, and I appreciate any suggestions you would have. 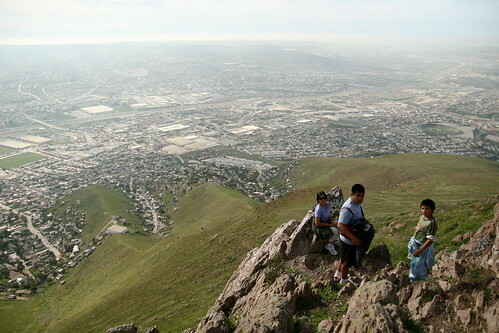 Today I did this hike and as I reached the top I was held up at gunpoint by two guys. They took my bag which had all my things in it including wallet, phone and passport. The police told me after that this happens often here so please make sure you stay away from this mountain!